Pediatric aplastic anemia/myelodysplastic syndrome (AA/MDS) is rare and the clinical and histopathological distinction between these two diagnoses is challenging. A prospective registration of patients suspected of having AA/MDS with a morphological central review have been conducted by the European Working Group on MDS in childhood (EWOG-MDS) since 1998. Then, the EWOG-MDS proposed a new pediatric-specific subtype of MDS, termed "refractory cytopenia of childhood (RCC)". RCC was subsequently included as a provisional entity in the 2008 World Health Organization (WHO) classification. However, the diagnosis of RCC has not been widely adopted outside of the EWOG-MDS to date. Over 80% of RCC has hypocellular bone marrow, therefore, a major proportion of children who meet the criteria of RCC have been historically given the diagnosis of AA and have been successfully treated as AA. The most important reason why RCC remains a controversial entity will be because clinical significance of the RCC classification has not been well determined. A morphological central review of pediatric AA/MDS with cytogenetic and molecular analyses was also started in Japan since 2009. I thought that more close collaboration with experienced members of the EWOG-MDS/SAA was required for better interpretation of the new classification from various aspects. My projects were to learn diagnostic work-up for accurate distinction of AA and RCC according to the 2008 WHO classification by joining practical review in the EWOG-MDS/SAA study center, then to discuss about the clinical significance of RCC entity on the basis of same diagnostic classification, and to investigate the optimal treatment strategies especially of stem cell transplantation (SCT) according to the classification. The EWOG-MDS was founded in 1993 by members from Austria, Denmark, Germany, Italy and the Netherlands and later joined by the Czech Republic, Switzerland and recently Poland, Belgium, Ireland, Spain, Hungary and Slovakia. In 2010 the EWOG-SAA was established using the same network. To date, many internationally collaborative studies on pediatric AA/MDS have been conducted by the EWOG-MDS/SAA, and morphological, cytogenetic and molecular genetics, and SCT boards have been organized and the database is located in the coordinating study center at the University Children's Hospital, Freiburg, Germany. I joined the Freiburg group led by Prof. Niemeyer from August 2015. Through daily morphological review with exclusive study physicians, Dr. Yoshimi and Dr. Niewisch, I could well understand whole processes of the review and study coordinating in EWOG-MDS/SAA in addition to the morphological differentiation between AA and RCC. This was extremely useful and allowed me to internationally discuss about various issues in the field of pediatric AA/MDS on the basis of same diagnostic classification. Twice a week, a meeting of the coordinating study center with all related members including study physicians, clinicians, technicians, data managers, labo researchers, and statistician was held, and they discussed deeply about the cases difficult to diagnosis, further possible assessment for those, adequate therapy planning for each reviewed case, results of newly genetic work-up, research projects and so on, which was very informative and impressive for me. Notably, the review report consisted of not only morphological findings but also treatment recommendation for each patient, which was one of the differences from the system in Japan. Although AA and RCC can reliably be differentiated morphologically by such a review system, the choice of the therapeutic strategy especially for hypocellular RCC without cytogenetic abnormalities can be somewhat confusing because of the overlapping pathophysiology. If diagnosed with RCC, the patient could be treated with SCT using myeloabrative conditioning (MAC) regimen like advanced MDS, even suspected of immune mediated pathophysiology. Therefore, I thought that the report with treatment recommendation in the EWOG-MDS/SAA was useful to ensure optimal care for affected patients and prevent overtreatment for hypocellular RCC. Since the diagnosis of RCC was proposed as a subtype of pediatric MDS, clinical differences between AA and hypocellular RCC have been of great international interest. However, there have been few studies focused on the clinical relevance of the new classification. Dr. Baumann, a reference pathologist of the EWOG-MDS/SAA reported that the initiation of strict differentiation of AA from hypocellular RCC through central review was associated with a marked reduction of clonal evolution after immunosuppressive therapy (IST) in patients with AA. 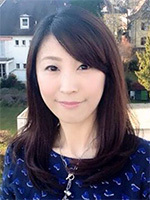 On the other hand, a Japanese study revealed that the incidence of clonal evolution after IST was not significantly different between AA and hypocellular RCC, and only longtime usage of G-CSF was a significant risk factor for the development of monosomy 7, which was the most commonly observed abnormality. Then, I had an opportunity to join a project to compare the incidence of clonal evolution after IST in German patients with AA vs. RCC registered to the EWOG-MDS/SAA studies as a member of the coordinating study center. Preliminary analysis showed that clonal evolution was a quite rare event in both AA and RCC, thus suggesting no difference of the incidence in these two classifications. Further definitive results including the impact of G-CSF to clonal evolution are warranted. Although we could not have fully unified perspectives on clinical significance of the new classification, it was quite beneficial to discuss directly by joining the team, a frontrunner in this field. As mentioned above, almost RCC patients have been diagnosed with AA and have been treated as AA in Japan. That is, in the setting of SCT, both patients with the morphological diagnosis of AA and RCC have received the same AA-oriented conditioning regimen. In contrast, patients with RCC have been treated as MDS in the EWOG-MDS, which was a unique opportunity to compare the outcomes of patients with RCC who received different treatment approaches. The EWOG-MDS had adopted MDS-oriented MAC regimen for RCC patients. An internal analysis showed that the outcome was not satisfactory due to the high rate of TRM (around 20%). Then, they changed to a reduced-intensity conditioning (RIC) regimen consisting of fludarabine (FLU) and thiotepa for hypocellular RCC, which provided better OS (over 90%) although there was some patients with poor hematological recovery or secondary graft failure. In Japan, we have experienced a certain number of patients with AA and RCC who presented with bone marrow aplasia with full donor chimerism after SCT (we named it "donor-type aplasia"). Our previous studies showed that patients who met the criteria of RCC were at high risk for donor-type aplasia when the AA-oriented RIC regimen (FLU+CY based regimen) was applied. Thus, the rate of EFS was about 85%, while the rate of OS reached 95%. Given this, we have recommended a new RIC regimen with more myelosuppressive effect (FLU+MEL based regimen) for RCC patients, resulted in improved outcome; both the rate of OS and EFS reached over 95%. Comparing these results in the EWOG-MDS and Japan, we can conclude that the MDS-oriented MAC regimen has no benefit for hypocellular RCC and the RIC regimens with more myelosuppressive effect than that of the AA-oriented regimen may resolve the issue of secondary graft failure or "donor-type aplasia". Our further discussion will contribute to major progress in clinical care for patients with pediatric AA/MDS. 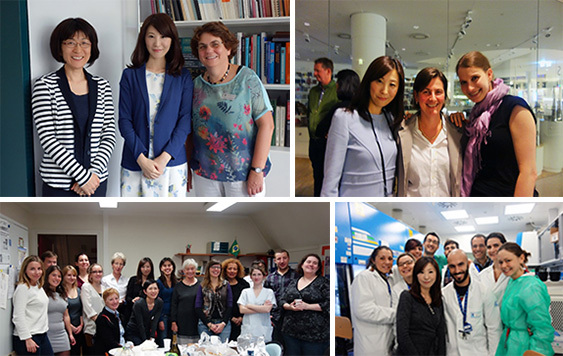 During my stay in Europe, I visited some experienced institutes for SCT. Bone marrow transplantation from a matched related or unrelated donor is the first choice of transplantation for acquired bone marrow failures including AA. Recently, successful results of haploidentical transplantation and unrelated cord blood transplantation (CBT) as alternative options have been reported. I saw the practice of haploidentical transplantation at Tübingen University, Ospedale Pediatrico Bambino Gesù, and Cattolica del Sacro Cuore, and of CBT at Robert Debre Hospital, St. Louis Hospital, and the Eurocord. It was extremely precious experience for me to meet a lot of frontline researches and discuss directly with them. Through this exchange program to visit University of Freiburg and other institutes, I confirmed that we had many interests in common and had remaining issues that need to be resolved in the field of pediatric AA/MDS. Because of the disease rarity, international collaboration is essential to develop better patient care. I hope to sustain and develop all these valuable relationships. My special thanks are due to Prof. Niemeyer for kind hospitality and informative guidance. I also thank Dr. Yoshimi, Dr. Niewisch, Dr. Wlodarski, Dr. Strahm and the colleagues of EWOG-MDS/SAA study coordinating center and department of Pediatric Hematology and Oncology, University of Freiburg. And, I am grateful to Prof. Handgretinger and Prof. Welte of Tübingen University, Prof. Dalle, Prof. Cave, and Dr. Meyran of Robert Debre Hospital, Prof. Socie and Prof. Peffault de Latour of St. Louis Hospital, Prof. Gluckman and Dr. Hayashi of Eurocord, Prof. Locatelli and Dr. Quintarelli of Ospedale Pediatrico Bambino Gesù, Prof. Bacigalupo of Universita' Cattolica del Sacro Cuore, and all their colleagues for the great hospitality during my visit. I also thank EHA and JSH for giving me this opportunity to have valuable experiences.